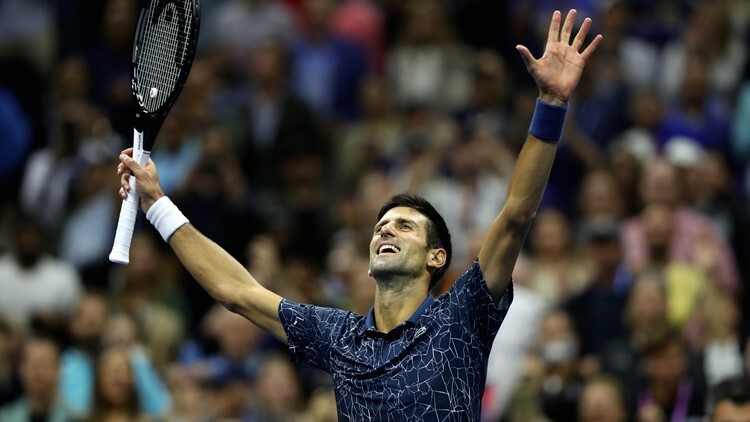 Novak Djokovic of Serbia celebrates after winning his men's Singles finals match against Juan Martin del Potro of Argentina on Day Fourteen of the 2018 US Open on September 9, 2018 in New York City. NEW YORK — There appears to be one winning formula for Novak Djokovic when it comes to taking home the US Open title. He just has to capture the Wimbledon trophy before arriving in New York. This marks the third time in his career he’s achieved that impressive double, winning Wimbledon and US Open titles back-to-back in 2011, 2015 and now 2018. Despite playing in eight US Open finals, he’s never succeeded without scoring at Wimbledon, too. In a battle between two former US Open champions — Juan Martin del Potro won his lone Grand Slam title here nine years ago here — it was Djokovic who prevailed 6-3, 7-6 (7-4), 6-3 on a rainy Sunday with the convertible-topped roof of Arthur Ashe stadium closed. Djokovic fell to the ground in celebration before embracing del Portro at the net. Later on, when an upset del Potro sat on his bench awaiting the award ceremony, Djokovic went over to hug him and have a word. The Serb now leads del Potro 15-4 in career meetings, and 5-0 in Grand Slam encounters. When Djokovic won his 13th Grand Slam at Wimbledon in July it was particularly pleasing as it was his first success at a major since he finally picked up the missing French Open trophy he so relished in 2016. That victory established a career Grand Slam for the Serb, completing his collection of winning at least once at each of the four Slams. Djokovic has been successful in five of the last six Grand Slam finals he’s played dating back to Wimbledon in 2015. His only loss in that period was to Stan Wawrinka here at the 2016 US Open. Last year is the only time in the last eight years he failed to pick-up at least one major trophy in a season. Early in the tournament the extreme heat and humid conditions in New York were clearly troubling Djokovic. There were actually a few occasions where there was wonderment that he was able to carry on. But a 14th Grand Slam trophy was in the offing, which if claimed would tie Djokovic in third place with Pete Sampras for most major trophies earned in the men’s game. Roger Federer leads with 20 Grand Slam titles, and Rafael Nadal shows off 17 in the museum at his academy in Manacor, Spain. When Djokovic is in peak health, as he finally is following a long bout with a right elbow injury that eventually required surgery after this year’s Australian Open, he is most definitely a man on a mission. In the category that it doesn’t matter how old one is, but rather how young they feel and can perform, the 31-year-old Djokovic is the ninth consecutive player over-30 to win the men’s title at a Slam. The last man to capture a major and not to be in his thirties was Andy Murray, who was 29 when he delighted British fans by winning his second Wimbledon trophy in 2016. Del Potro cracked first when serving in the eighth game of the first set. Ahead 40-0 he wasn’t able to capitalize on any of the three game points, then went onto make two forehand errors to surrender his serve. Djokovic, who has returned to the calm, cool and collected version of himself that routinely won Grand Slam titles, served out the first set in the next game. After both players exchanged earlier service breaks in the second set, it became key that Djokovic held onto his serve in the eighth game, staving off three break points in the 22-point game that lasted 20 minutes, 32 seconds. Djokovic seemed on his way to a smooth victory with a 3-1 lead in the third set, but Del Potro wasn’t quite ready to surrender. He recouped the service break in the fifth game, but after holding serve, Djokovic went onto win the final three games of the over three-hour encounter.